Endless beaches, dunes and colorful beach chairs as far as the eye can reach: The Best Western holiday hotels lure guests all year round with many possibilities for leisure, sports and recreation at the coast. The individual hotels of the brand offer the right choice for every travelling style – from sun bathing or wellness to golf or biking. Seven times Baltic Sea with Best Western: At the Timmendorfer Strand, Ruegen, and Usedom individually operated hotels of the brand are welcoming their guests. The houses of the three and four star segment specialize on wellness and recreation, on golf and other sports activities or the classical family holiday. 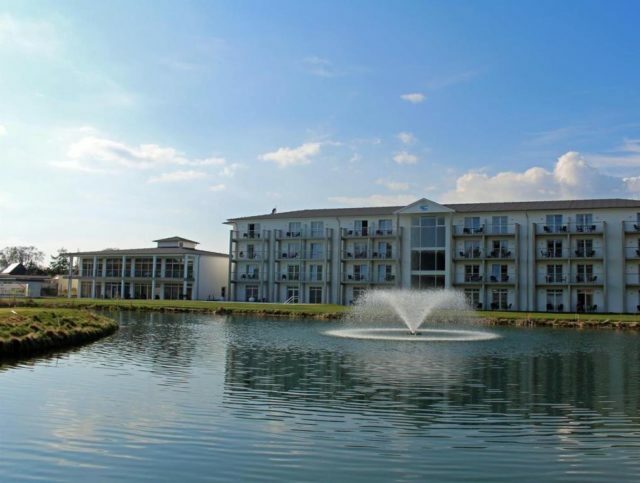 For the first time this year, Best Western also brings maritime flair to Rheinland-Pfalz. The Best Western Hotel Alzey, surrounded by vineyards in South-Western Germany, is turning into a Baltic Sea theme hotel and greets the guests with white sand and cabins instead of normal rooms. A popular holiday destination at the Baltic Sea is the Best Western Plus Baltic Hills Usedom with 84 rooms, suites and family apartments. The sunny island Usedom offers a 45 kilometer long coast and a number of small bays, where it is always possible to find a quiet place to relax. There is more to it than that: The sunny island is also a paradise for passionate golfers. The Best Western Plus Baltic Hills Usedom is located directed at Germany’s first 19 hole golf court, where the guests can pursue their favorite hobby. Moreover, the four star hotel offers a discounted green fee, golf packages and various golf courses. After one day at the golf court the guests can have a good time in the spa and wellness area. They can choose from two indoor saunas, one Finnish blockhouse sauna, a heated outdoor pool as well as massages and cosmetic treatments. The famous “Dreikaiserbaeder” Ahlbeck, Heringsdorf and Bansin are accessible by car or with the free beach shuttle in five minutes. Many guests are attracted by the popular Baltic island Ruegen. An even longer beach – around 60 kilometers – and lively Baltic Sea spa towns are waiting on Germany’s biggest island. In one of them, in Goehren, the team of the Best Western Alexa Hotel welcomes the guests in the design of the historical spa architecture – the hotel with 62 rooms was developed back in 1908 already. Today the three star superior hotel has modern facilities and a wellness area for cold days. The beach is also only 500 meters away. Nature, wellness and cuisine experience the guests of Best Western Plus Ostseehotel Waldschloesschen in Prerow. The family-operated four star hotel is located directly at the Darsser Forest, only 300 meters away from the broad, fine sandy north beach of Prerow, which is considered to be one of the most beautiful beaches in Europe. The idyllic landscape around the hotel with 40 rooms are best explored actively. During a bike trip in the national park Darsser Forest one can forget about daily routines. Moreover, the popular Baltic Sea cycle path runs through the small village Prerow. For a fee, bikes can be rented directly at the Best Western Plus Ostseehotel Waldschloesschen. For recreation afterwards, the wellness area “Waldspa” awaits the hotel guests with an indoor pool and a heated outdoor pool. In the hotel restaurant Titania the team serves fresh meals using regional and seasonal products from local suppliers. All those who like to avoid the hassle of travelling far can enjoy the flair of the Baltic Sea elsewhere with Best Western. They can find it in Rheinhessen, 800 kilometers away from the Baltic Sea. After comprehensive reconstruction, the Best Western Hotel Alzey is turning into a Baltic Sea theme hotel. Except for the fresh ocean breeze and the sea view everything is taken care of. Maritime materials can be found throughout the house and as decoration elements real anchors, paddles, nets, sails or buoys are used. Like in a beach hotel, there are wooden floors and a big real wooden boat is hanging in the middle of the lobby. The other Best Western hotels at the Baltic Sea are: Best Western Hanse Hotel Warnemuende in Rostock-Warnemuende, Best Western Hotel Hanse-Kogge in Koserow/Usedom and Best Western Hotel Timmendorfer Strand.